Happened this morning at Chetpet at the Venkata Subba Rao auditorium. 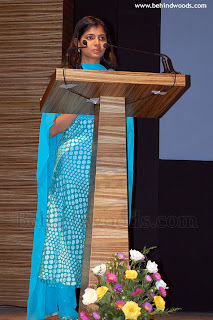 I had the fortune of being able to compere the Press Meet and and I was supremely jelly kneed through out. When we go to work at Rahman sir's place talking is at minimum. The best mode to be in especially at his studio is the silent mode. How else would one be able to learn if one does not keep silent? Something that I learnt from Mom. She usually says, that God has given us one tongue, and two ears, two eyes. Assimilation of information should always be 4 fold. And talking should be kept to the minimum or nil at most times. Especially when in exalted company. 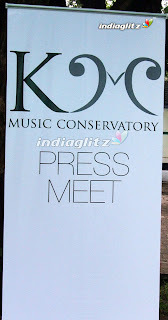 Talking in front of Rahman sir especially on stage is something I have never done, and in addition there were some of the biggest names in the Industry present there, who are mostly on the advisory board of K M Conservatory. Was I nervous? You bet. But thereafter I got used to it. Obviously I do not have any pictures but those that I have found on the internet. And I am now off to get some shut eye. Has been in very short supply lately. How about following that advice when you are @ Ahaa? If I ever have the chance to meet up with you, believe me I wont say a word. Not even a HI ! Good updates! was reading all posts actually..and i liked A.R.Rahman's quote in "Valentines Day" Post. Simply intellectual-ish. I guess i missed out your song for nala Damayanthi. Never heard. Will comment back after listening to it. and its quite a nice coincidence, that i visit your blog and the song which is playing in my play-list here is: Tere Bina from Guru. Great gesture from the greats of the music industry. Sure to become a global music school soon. Hahahah so this was what u were buzzing ard for the day before eh... Hahahaha Don't worry.. Ungalukku pesa solliya kodukkenum =P !! ARR:I heard that you are blogging? Chin: Yes bhaiya, whn are you going to blog? i think too many stars went up on the stage and out shined you. but this is just the beginning. you have changed from the silent girl to a tv host, a radio RJ and now a show compere. the way i see it, you are getting braver. 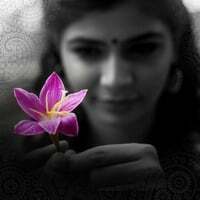 Good going Chinmayi..by the way I am new visitor to your blog. Not too great in passing comments..but a great reader though..have you been in US? Let me know when you make a trip next time. May be I can catch up with ya. That's a very nice attempt by Mr. A.R.Rahman It must have been a great feeling to address the press on this special ocassion. Will the legend himself teach at the school? who cares whether you say a Hi or whatever! aruthi: nervous yes.. but that picture has apparently caught me mid sentence! Anonymous: thought I will be polite and not publish your comment here. Any tamilian will tell you that Anna means elder brother. How come you have never come across the meaning of that term? 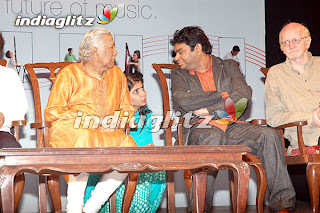 And I refer to Rahman sir automatically as Anna because I sang for him while I was still in school. I consciously correct myself to call him Sir nowadays though. But to me he is a lot more a Guru. If you have any doubts let me know.. I run a translation company anyway, and the tag line of my company reads, "we translate anything" hehe.. even if it is a line as yours. and anonymous number 2: I am sure there are several who care.... but then I still need some people like you .. life is without spice otherwise .. please continue and contribute to my hit counter..
just wondering..what was the purpose of the KM conservatory...can figure out that it has something to do with music :P! btw, love the new promo for kaapi club! Hey Kutti Pappa Chin! Looking very innocent in that blue dress. Chooo Chweeet. 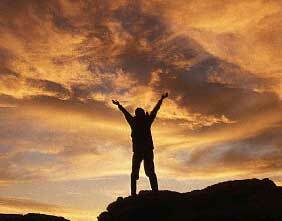 You did not tell what was the purpose of the meeting.Any way best wishes and congrats for all your improvement. Not sure if this is the appropriate place to say this: I caught you on Sun TV singing Mayya Mayya From Guru. I never knew you sang that. And I think it is amazing how you can go from singing in Kanathil Muthamital to a song with middle eastern flavor. I really thought AR brought someone from there :). Bottom line is you are AWESOME !!!! I never really read through the entire set of comments here. That was actually my very first anonymous comment. Don't confuse me with the others. Then again, How can I say that? we all anonymous users have the same name eh?. In any case, I went for a gas break (yeah, went for a drive to pump gas), Ended up listning to your new song from Thotta. You sounded different again. So did Naresh. Is it me? Yes... Chinmayi...! "Mugam Poo" from Thotta is wonderful song. Nowadays am listening to that song only from my handset. Papi: well so why are you here? anonymous: not interested.. I don't have to make any attempts for such things .. happens automatically! For someone who entertains thoughts like your previous comment, you hardly warrant a response. What you could do is do a systematic clean up of your brain, cos the way your comment stinks I can see it has been rotting in hell for a while..and oh yeah btw, since you seem to be a master of all the exalted qualities you mention, why not blog about it so that I could learn from the likes of you.. Ippadikku, enrum thangal adi panindha chinmayi. Wow...What's going on here? Whose comment are you referring to ? I saw ur post.."I wouldn't u saw hi to u".. all of us? I don't think anybody expects celebrities to say hi to them in streets. Wat abt autograph's/ photos? In Canada, there was a concert were u can dine with SPB and Jesudas right ... I know u sang there but were u there for the dining part ... and if u were there and if asked for autograph/pic will u say no? Just curious..
anonymous: no you doof.... a twitter badge is something that I DO NOT need ... its of no use to me.. and thanks for being exemplarily nice I am not about to accept yours..
Just wondering what could be the abbreviation of KM? Any clue folks? 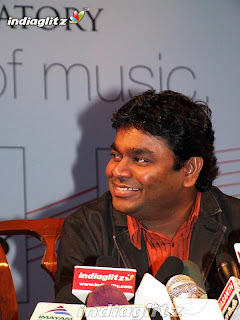 KM, most probably refers to Rahman sir's great inspiration, the holy Kwhaja Mohinuddeen. I work with some of the best stylists and designers in Chennai.. I shall pass on your compliments to Rehane when I meet her.. she didn't get to LIFW for nothing.. and yes she is brilliant! When u say "anonymous: no you doof.... a twitter badge is something that I DO NOT need ... its of no use to me.. and thanks for being exemplarily nice I am not about to accept yours." R u ref. to me cuz, I am the person right b4 that comment? I don't think I said anything wrong. A person needs to know when they r being yelled @!!! She is referring to a particular anonymous commenter whose posts are never or rarely published due to their crude content. and i still have no clue how Rehane got into this.. I hope ur right.. cuz I though since I said something abt meet her .. she got upset.. The second photo from the bottom, What are you doing playing pick a boo(hide and seek)? haha.. I am not picking any boo yet. I dont want to pick any.. I guess you mean peek a boo (in brackets, hide and seek). and haha. hello chinmayi! i am a great fan of yours and would love to hear more songs from you keep rocking!